Arthur Schlesinger Jr. is an outstanding historian of the United States and an influential supporter of the Democratic Party. Arthur Meier Schlesinger Jr. was born on October 15, 1917, in Columbus, Ohio, with the name Arthur Bancroft Schlesinger, later changed by dropping his mother's maiden name and taking his father's full name. Schlesinger's father was one of the leading historians of the 1920s and 1930s. 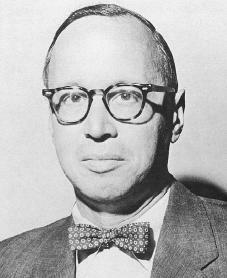 Arthur Schlesinger Sr. (1888–1965) taught one of the first college courses in American social and cultural history (in the early 1920s), he was a leader in the study of social history, and, as a professor at Harvard University between the two world wars, he directed the graduate work of several students who became noted social and intellectual historians. Thus, young Arthur was surrounded by American history. Arthur Jr. graduated from Harvard University at age twenty and published his honors thesis (a written essay containing original research presented for an advanced degree) one year later. He then spent a year studying in England but did not pursue further degrees. During part of World War II (1939–45; a war fought between the Axis powers: Italy, Japan, and Germany—and the Allies: France, Great Britain, the Soviet Union, and the United States) he served in the U.S. government's Office of War Information. As a member in the Society of Fellows at Harvard he was able to do the research for The Age of Jackson, a biography of the seventh U.S. president, Andrew Jackson (1767–1845), which was published in 1945. Though Schlesinger Sr. was a liberal (a person open to social improvement through change) and a Democrat, his work as a historian generally was not used to further his political views. Schlesinger Jr. was more active in politics, and it was his political involvement and the relation of his writing to that involvement that made him a public figure of unusual interest. The Age of Jackson, which Schlesinger Jr. wrote during Franklin D. Roosevelt's (1882–1945) fourth term as president, argued that the reform era in the years before the American Civil War (1861–65; a war fought between the U.S. government and eleven southern states over opposing views on issues such as slavery and trade) was a reaction to one of many conservative (opposed to social change) periods that failed to address the nation's problems. Schlesinger argued that democracy under Jackson was a social movement that began among poor people in the eastern and southern parts of the country. This theory of regional organization was also linked to Roosevelt's New Deal (1933–39), a series of programs that attempted to carry out political, business, and social reform. It was said that The Age of Jackson "voted" for Roosevelt as well as Jackson. The book was awarded the Pulitzer Prize, and Schlesinger was appointed to the Harvard history department, joining his father. In 1949 Schlesinger published The Vital Center: The Politics of Freedom, a history of American social thought organized around the political issues of the years following World War II (1939–45). The Vital Center "voted" for Harry Truman (1884–1972), whose election as president had taken place one year earlier, both in terms of his support of domestic programs, such as those of the New Deal, and in his opposition to totalitarianism (the complete control of power by a government). The Vital Center remains a lasting description of the ideas of the mainstream of the Democratic Party. While Schlesinger was a Harvard professor, he moved his focus from the period before the Civil War to that of the New Deal. Teaching American intellectual history from the colonies to the present, Schlesinger concentrated his research on the Age of Roosevelt and published the first three volumes covering the years to 1936: The Crisis of the Old Order (1957); The Coming of the New Deal (1958); and The Politics of Upheaval (1960). In the mid-1980s he resumed work on his multivolume history of the New Deal. Schlesinger was an active supporter of Adlai Stevenson (1900–1965) in Stevenson's unsuccessful bids for the presidency in 1952 and 1956, and he served as a speechwriter for John F. Kennedy (1917–1963) during his 1960 campaign for the presidency. Kennedy or Nixon: Does it Make Any Difference (1960) made his case for Kennedy. After serving in the White House as a special assistant to Kennedy (it was said that the two men met every day) and resigning his position at Harvard, Schlesinger wrote A Thousand Days: John F. Kennedy in the White House (1965), for which he was again awarded a Pulitzer Prize. of Humanities at the City University of New York in 1966 and president of the American Institute of Arts and Letters in 1981. In addition, he served as editor of the History of American Presidential Elections (four volumes, 1971), and in 1986 he wrote fourteen essays describing The Cycles of American History. Following Bill Clinton's (1946–) 1992 presidential nomination acceptance speech, Schlesinger stated that a new era in the United States had begun. He based his opinion on the cycles of American history theory put forth by his father. The elder Schlesinger predicted in 1939 that the New Deal would run out of steam in the mid-1940s. It would give way to a conservative tide, he predicted, which in turn would yield a new liberal era starting in 1962. The next conservative phase would begin around 1978. On the strength of this record, it was logical to predict, as the younger Schlesinger did in 1986, that at some point, shortly before or after the year 1990, there should come a sharp change in the national mood and direction. The reason each phase returned at roughly thirty-year periods, Schlesinger said, was because generational change kept the cycle going. But because each generation retained its belief in its youthful dreams, Schlesinger continued, the forward movement was guaranteed. During the 1990s Schlesinger was among an increasing number of political observers who recognized that all was not well with multiculturalism (the maintenance of many different cultures and ethnic traditions); he felt that placing too great an influence on maintaining original cultures inside the United States made it impossible for there to exist a single, unified "American" culture at the same time. This led to the 1998 publication of The Disuniting of America: Reflections on a Multicultural Society, a new, enlarged edition of Schlesinger's 1991 book about the subject. Also in 1998, Schlesinger was awarded a National Humanities Medal by President Clinton for his contributions to history. In 2000 Schlesinger published A Life in the 20th Century: Innocent Beginnings, 1917–1950, the first volume of his memoirs (remembrances of his life), in which he took a look back at the past century. Cunliffe, Marcus. "Arthur M. Schlesinger, Jr." Pastmasters: Some Essays on American Historians. Edited by Marcus Cunliffe and Robin Winks. New York: Harper and Row, 1969. Schlesinger, Arthur M., Jr. A Life in the Twentieth Century. Boston: Houghton Mifflin, 2000.